Editor’s note: Baseball is back and Yahoo Sports is previewing all 30 teams over the next month. This year’s previews will focus on fantasy and reality, as our MLB news staff and our fantasy baseball crew come together to assess each team before opening day. Next up, the New York Yankees. The long-awaited New York Yankees 2018 free-agent spending bonanza didn’t quite materialize like people had been talking about for years. Bryce Harper didn’t put on pinstripes. Neither did Manny Machado. But you know what? The Yankees will be just fine in 2019, so long as injuries don’t take a further toll on them. Even though their offseason was less “make-it-rain” than the experts had expected for years, the Yankees still added ex-Seattle Mariners ace James Paxton in a trade and once-All-Star shortstop Troy Tulowitzki on a buy-low deal after the Blue Jays released him. Fact is, the Yankees have everything they need to go head-to-head with the Boston Red Sox in the AL East, so long as ace Luis Severino isn’t long-term hurt. Shoulder problems have sidelined him, and he won’t pitch opening day, but we don’t know the full extent. 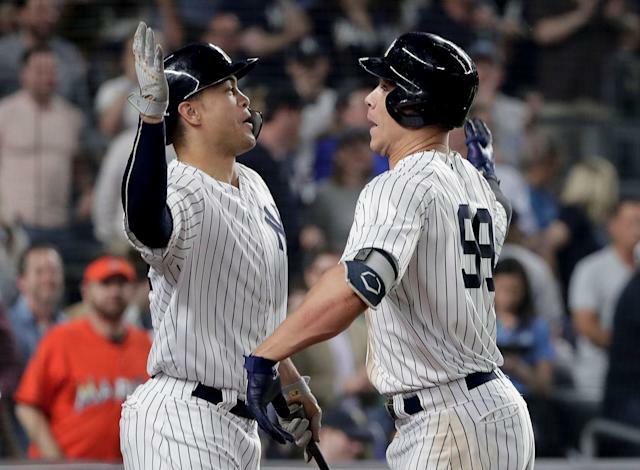 With Aaron Judge, Giancarlo Stanton and Gary Sanchez in the middle of that order, and Aroldis Chapman, Dellin Betances, a re-signed Zack Britton and newcomer Adam Ottavino sitting in the bullpen, the Yankees are as dangerous as they come — either in real baseball or on your fantasy team. There are a lot of people who can help win games in the Bronx, that’s for sure. That bullpen may be the biggest advantage the Yankees have over the Red Sox, who aren’t heading into 2019 with an experienced closer. 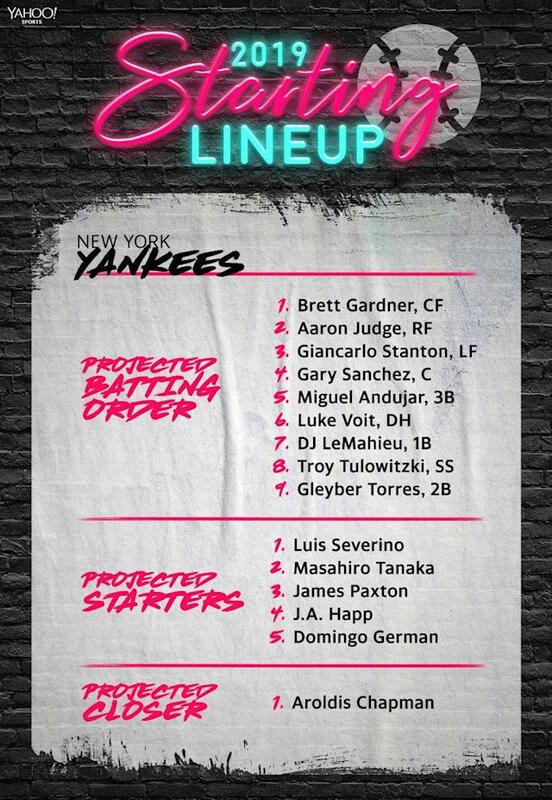 The Yankees, meanwhile, are hoping to bash a lot of homers and lock down the last three innings. Yankees GM Brian Cashman could look like a genius if Paxton stays healthy and Tulowitzki has some of that old Tulo left in the tank. Those two, if things swing the right way, could be huge for the Yankees. Another big addition is DJ LeMahieu, the former NL batting champ who came over the from Rockies as a free agent. In the crowded Yankees infield, he may just be platooning at first base. Or he could help elsewhere if needed because of injuries. It’s a sign that the Yankees are deep. Add Britton and Ottavino to the offseason haul and you have a Yankees team whose offseason could end up like a millionaire finding jewels at T.J. Maxx instead of spending $300 million at Louis Vuitton. What is the Yankees’ biggest fantasy question? What big name is New York’s player to avoid? 1. Luis Severino gets well: On the heels of his $40 million extension, Severino was shut down with a shoulder ailment that will keep him out at least through April. Now the Yankees have to hope this doesn't become a long-term issue for their ace. The Yankees rotation depth will also be tested with CC Sabathia expected to begin the season on the injured list. It all centers around Severino though, because there's no one there who can replace his top level talent and production. He's the go-to guy, and they'll need him at 100 percent to keep up with the Red Sox. 2. Gary Sanchez figures it out: 2018 was an all-around disappointment for Sanchez. He was limited to 89 games due to injury, and when healthy he was constantly under fire for his sloppy defense. Even manager Aaron Boone called him out, which many believe was an eye-opener for Sanchez. The hope is he'll start to embrace blocking balls in the dirt as much as hitting them over the fence. The Yankees need Sanchez's bat in the lineup, and they'll need his defense to improve to keep him there.